There are times that certain actions of people look just too ostentatious or wasteful. It bothers us to think that people are willing to be so extravagant in expressing their love. The Taj Mahal comes to mind. Such a colossal edifice, built in memory of a woman. This is really sometimes the language of consecration. AT THE HEART OF IT IS LOVE. Today, we examine the story of a woman known simply known as, Mary of Bethany. Mary had become close to the Lord Jesus. She had learnt to sit at His feet and hear His words. In this her devotion, she had learnt how to judge His moods and read His heart. She also had developed a keen understanding of the timings of the Lord. One day she came into the room where the Lord was and broke open a very expensive alabaster jar of fragrant oil or perfume. The value of this jar of perfume was a year’s salary for some people. It was very expensive stuff. There are four accounts of this anointing in the gospels and I am sure they refer to the same person. Her show of love was overwhelming. 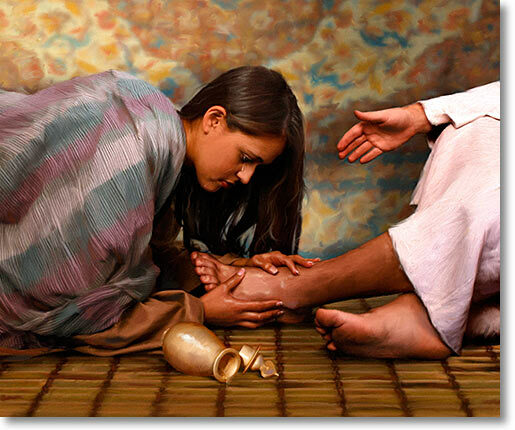 She not only poured out this expensive oil on Jesus, she used her hair to wipe His feet. Some of Jesus disciples were indignant and questioned such waste. They felt they could have sold the perfume and used the money to feed the poor. But Mary was not thinking about the poor. She was thinking about the Lord, who had been so good to her. She was wondering what she could do to honour the Lord, before He went to the cross. She decided that the most valuable possession she owned was just what she would give Him. This reminds me of a song we learnt when we first became believers in Jesus Christ. What shall I render to you my Lord! Jesus spoke up on her behalf and what He said is so profound “But Jesus, aware of this, said to them, “Why do you trouble the woman? For she has done a beautiful thing to me. For you always have the poor with you, but you will not always have me. In pouring this ointment on my body, she has done it to prepare me for burial. Truly, I say to you, wherever this gospel is proclaimed in the whole world, what she has done will also be told in memory of her. This woman gave her way into history. She gave her way into an eternal reward. Jesus said wherever the gospel is preached, what she did will be remembered. In effect, Jesus tied her giving to the proclamation of the gospel. WOW! This is consecration. She gave her most valuable possession and Jesus rewarded her with a place in history. What can you give to the Lord as a mark of consecration today? Who is going to be the next history maker? Who out there is the next Mary of Bethany? What have you been storing up that could be used to honour the Lord? Consecration is the way pathway to growth in the Lord. Let’s Pray: Father God, it is obvious that you honour those who honour you. Help me to not hold back when it comes to expressing my love for you. Let me be termed ‘wasteful’ in my expression of love towards you. I ask for this grace in Jesus name. Amen. Our giving in Christiandom says “Give and you shall receive, good measur…..” whilst the world says “give and it depletes what you have saved”….. As christians, we should not hold on to material things (they will only fade away). Assuming Mary held on to that Alabaster oil…..she would have finished using it by now and woul dnot have received a place in history. My advise to christians is to always ask the Lord for a discerning spirit. Submit to the spirit and obey every instruction to give, as you never know where, how and when the seed will speak for you.